Sara Lafleur-Vetter Lesley Phillips and Sharena Thomas founded The People's Community Medics last year. The first sixty minutes after someone is shot is commonly known as the "golden hour." The name refers to the fact that irreversible damage can occur in the first hour after someone suffers a profound shock. If a person is shot in the head or chest, or if a blood vessel is struck, the window for treatment can become much shorter. 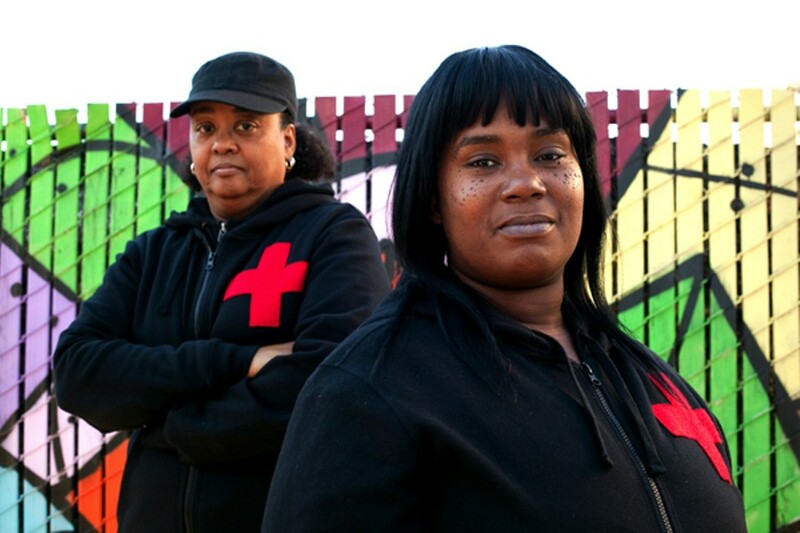 But gunshot victims in Oakland don't always receive prompt medical care. In fact, first responders can be dangerously slow to arrive on scene. As a result, some activists have started to teach local residents how to save lives. According to data obtained from the Oakland Police Department, there were 36,236 high-priority 911 calls made in 2012 — most of which were for violent crimes. But it took the understaffed police department between ten and thirty minutes to arrive at 36 percent of those calls. In 13 percent of the cases, OPD showed up more than thirty minutes after the initial call for service. Alameda County paramedics can almost always arrive at urban crime scenes in less than nine minutes, but for safety reasons they're prohibited from treating victims until police clear the scene. As a result, they must stage their ambulances blocks away from critically injured people as they wait for OPD to allow them in. "Paramedics can't just rush into a shooting scene," explained Fred Claridge, director of Alameda County's Emergency Medical Services. "They park a few blocks away and wait — and that's to preserve their own safety." This makes police officers the first medical responders to most violent crimes in Oakland, and while they're required by state law to know how to treat gunshot wounds, they don't always make it a top priority. Sometimes officers will focus on gathering evidence and securing the scene before they help someone who's injured. "The officer has to weigh up between protecting the crime scene, protecting the victim, and protecting the integrity of what's going on around them," Oakland police union President Barry Donelan said in an interview last year. He added that "an officer's job is to take care of the victim, but to do that they have to stabilize the scene first." 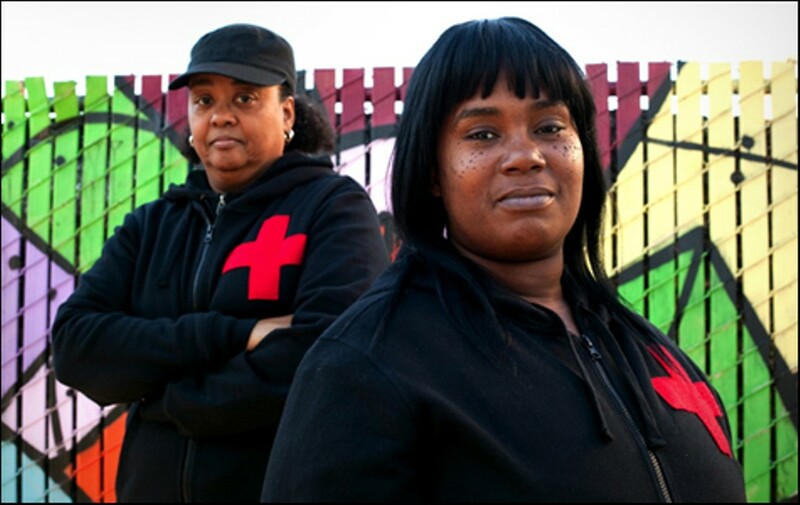 OPD's poor response times, paired with officers' decisions to not treat injured citizens quickly, prompted East Oakland residents Sharena Thomas and Lesley Phillips to found the group The People's Community Medics last year. Both Thomas and Phillips have some medical training, and they teach citizens how to administer basic first aid to gunshot victims when police are slow to arrive and when paramedics are prohibited from providing help. Since last March, The People's Community Medics have held workshops throughout Oakland, as well as in Berkeley, San Francisco, and Seattle. "At every training we've done someone says they've seen someone being shot, and they didn't know what to do — they just stood around and watched the person bleed out," said Thomas. "If those people knew how to treat a gunshot wound, maybe they could have saved a life." At a first-aid training I attended in January, Phillips began by sharing the golden rule of medical care: "First and foremost, do no harm! I can't say it enough. If you don't know what to do, then don't do anything at all." She and Thomas then covered the legal and moral issues that arise when assisting crime victims. They finished with a skit detailing how exactly to treat and dress a gunshot wound. "You have to find the entrance and the exit wounds," said Thomas. "Once you've located them apply firm pressure to both holes. If possible, wear rubber gloves and use a barrier, such as gauze, to stop the bleeding." Phillips handed out packets containing both of these items, along with medical instructions. While the information the group provides is basic, The People's Community Medics is filling a growing gap in Oakland. The police department, which has two hundred fewer officers today than it had three years ago, has become increasingly unreliable during times of crisis. And technical mistakes made by the department over the years have further hampered first responders. An auditor's report released last August showed that the OPD's Computer Aided Dispatching system is inefficient and outdated. If it were replaced, officers could more effectively be routed to crime scenes. Last year, $1.2 million was available to replace the system, however, OPD squandered the money due to poor communication with the Department of Information Technology. According to Sergeant Christopher Bolton, chief of staff to Police Chief Howard Jordan, the department is preparing to roll out a new deployment system, but it's unclear when it will be up and running. "We don't want to always be complaining about resources," Bolton said. "It's incumbent on us to come up with ways to deploy the officers and meet the community's expectations, and response time, especially in the most urgent of matters, is probably the most fundamental expectation that people require of their police department." The gunshot tracking system ShotSpotter also has the potential to quicken OPD's response to gun crimes, but for the past five years it's been underutilized. ShotSpotter can give an officer the exact location of gunfire within 45 seconds. Last year, the system recorded about 3,000 gunshots in Oakland, or roughly eight a day. While some cities have used ShotSpotter to significantly reduce gunfire, budget problems have prevented OPD from making good use of the technology — less than half the city is serviced by ShotSpotter, and the majority of recorded gunshots aren't investigated. However, in a few months the city will expand the ShotSpotter service area to cover about 80 percent of Oakland, which Sergeant Bolton contends will help OPD combat gun crime. "It's extremely valuable for response time, evidence collections, determining where scenes are," he said. "It's just an amazing system." Thomas and Phillips, meanwhile, are not only hoping to empower citizens to help injured people in need, but they also hope their work will unite community members against violence. At a first-aid training put on by the group last September, a young woman shared her experience helping a gunshot victim near Arroyo Viejo Park in East Oakland. "I was sitting in the park when I heard rapid gunfire and I saw smoke clearing just at the other end of the field," she said. The woman knew basic first aid and CPR, so she did something courageous: She ran to the scene. She found a man with four gunshot wounds. "He was shot once in the head, once in the arm, once in the stomach, and once in the leg." The woman covered three of the four wounds, and held the man firmly for what she estimated to be 25 minutes, until the paramedics arrived. The man was seriously injured, but he survived. "I thank God that I knew what to do, and was able to help. ... Most people, when they hear shots, their instinct is to go running, but when something like that happens, we've got to come together as a community." The People's Community Medics believe they can inspire more people to act similarly. They've already received reports back from people who've used their training in Oakland and San Francisco. And over the longterm, they want to change the way people think about violence. "I feel that if people start to know these skills, and they know how to save a life, they might not be so quick to take a life," said Phillips. "If you're teaching how to save life, that's love."